What do dwarf planets, Creative Commons licensing, and the punctuation (or lack thereof) in the word “email” have in common? Give up? 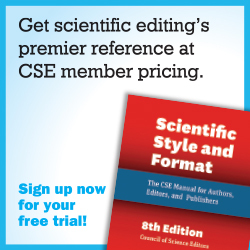 All are subjects of updates in the recently published CSE style manual, Scientific Style and Format 8th Edition (SSF8). You have no doubt heard about the release of CSE’s flagship book, which landed on shelves in May 2014. 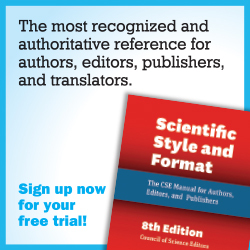 However, if you work in the scientific or medical publishing industry but your job does not require you to focus on such details as whether a sentence should begin with a gene symbol that begins with a lowercase letter or data should be displayed in a table with a stub column or as a bar graph, then you may not be aware of parts of our manual that could be just as useful to you. For example, if you are a newly appointed editor-in-chief and want to learn about the general role and responsibilities you should be taking on, Chapter 2, “Publication Policies and Practices”, is worth a read (and probably a bookmark and several sticky notes—either in the print copy or electronic versions in the online edition; more on that in a minute). It outlines not only what an editor’s responsibilities should be but also those of authors and reviewers and how each of these people work with the others. You may have also heard that SSF8 is available to subscribers, for the first time in CSE history, as a fully searchable online reference. Besides containing the same content as the print edition, the website helps readers to easily search, read, and browse— offering multiple ways to find content. The “Tools” section (see Fig. 1) contains many other useful guidelines, samples, and a citation quick guide, among other offerings. Another helpful feature of the website is that you can bookmark any section or make your own electronic sticky notes and flag, for example, that tricky style point you only use once a year when you are indexing. The bookmarks and sticky notes are then saved and can be referenced in the “My Scientific Style and Format” section (see Fig. 1). Finally, a recording of the May 2014 webinar is now available to members and nonmembers. If you were unable to attend the live webinar or would like to view it again, it’s worth a watch. Go to http://www.councilscienceeditors.org/resourcelibrary/past-presentationswebinars/pastwebinars/2014-webinar-1-cse-style-manual-updates/ to download the video file. An overview of the new website is narrated by David Morrow, senior editor at the University of Chicago Press, which published the manual and designed the website. There is also a detailed walk-through of the major updates in each chapter. So whether you are a copy editor, managing editor, editor-in-chief, or anything in between, you are sure to find SSF8 a useful tool to have on hand. Where else can you learn to distinguish between data falsification and data filtering when reviewing a manuscript (Sec. 2.3), the new recommendations on naming single-nucleotide polymorphisms (Sec. 21.2), and how to cite that infographic on vaccinations (Sec. 29.3.7.13) all in one place? Will Video Kill the PDF Star? Is a Virtual Office Right for You?